Jinn Accused for Fire-Setting and Stoning ! "The Jinn started throwing the stones at the house continuously for three days. The stones were coming to us from all sides and aimed at any place where my family members gathering , then the accidents of fire followed that in hay and plants bags and then in the clothes and furniture without seeing a doer or knowing the cause of fire" One of family members Said. This is not a scene from a science fiction movie, but it is a testimony of one member of the family X in the Had Al-Soualem region - province of Settat- Morocco, house residents lives turned upside down because of a strange phenomenon which they experience its events for 20 days ago. This happenings usually connected to a Poltergeist activity in western culture. Ibrahim says (in his forties) while he is referring to the pile of ashes resulted of fires on the house which is inhabited by more than 15 persons: "Our house in just three weeks was an target to more than 15 fire accidents that destroyed the 6 bags of hay and it flared 7 times inside the rooms and the crop of plants burnt twice and the strangest thing is that when we extinguish the fire , there was another fire broke out near it". Ibrahim adds while he rubbing his forehead with his right hand fingers, expressing his astonishment at this phenomenon: "Because of the successive of fires we became to live in constant fear as we sleep and wake up with our hands on hearts fearing of a new outbreak of fire somewhere in the house". 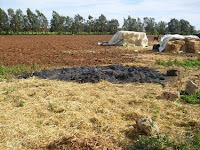 Despite extensive material damage caused by fire in the family X farm , Ibrahim raised his hands, looking to the sky and his tongue to speaking constantly of praising to God that these fires did not cause - so far - in any loss of persons ,saying: "Because fortunately the Jinn did not blaze it except in the places which are free from any humans or animals ". and he said explaining:" There was a dog tied to one of the hay bags, and when the Jinn set fire to the hay harvest , the first thing which burned was the rope which linked to the dog to prevent it from harm, and the stones that were raining on the house did not cause any harm o any member of the family, although its intensity, as it was thrown next to the person without causing any harm to him/her ". This house people did not call either the local authorities or the firefighters to investigate and find out the source of these accidents but they dragged all to give "metaphysics" explanations which have no scientific explanation. Ibrahim added :"All the legists who we brought them down to that house said that those accidents were caused by the Jinn" and Ibrahim confirming saying : "There is someone envying this family members of their coherent among themselves and aiming to disperse them in various ways and he/she authorized the Jinn on the house to terrorize us and force us to disperse". As far as Ibrahim and his family cling to this belief, they also insist on patience and face this "catastrophe" as a fate which they can not do anything to overcome it except trusting in " legists blessing " in waiting for "the dispel of God". The number of legists who tried to expel the Jinn from this house reached five legists, four of them were not successful in that and the work of the 5th did not establish whether it was " successful " or not, but the stoning and fire have been stopped since last Friday (19-February-2010), according to Ibrahim who confirmed that the legist has distributed several " amulets " at the entrances of the house, after reading out some verses of the Holy Koran on them. In commenting on this phenomenon, "Abdul Salam Kamony" (An enchanter legist in Azemmour region) saying that it is no longer a strange phenomenon after it became frequent. Kamony also pointed out that the causes of fire lie mainly in the "witchcraft" which is occurs by authorizing the Jinn on humans for some purpose , he also said that he passed on many of the phenomena of this kind and he could treat them by reading the Holy Koran and repeating the prayer "To migrate the Jinn" in a period ranging between 3 and 7 days. He added that he recently treated two similar cases in "Sokhor El-Rahamina" and "Aolad Mosa" village pointing out that they were much more difficult because of losses suffered by the victims. The events and facts that have occurred and still occurring in this house do not become vacant of the novelty despite of the bizarre. Ibrahim says that the Jinn who is behind these events is responsive to family members, as he is hearing their talk and do what they ask from him at once without hesitation. It is said that one of the youths (a nephew) was calling the Jinn and urge him to proceed in stoning if he stopped it then the stones come back from all sides . When Ibrahim remembered another interesting novelty , he could not stop laugh, then he said: " Once upon the time one of my brothers had addressed that Jinn saying: "Why do not you throw a bag full of money on us instead of stones? !, And after a moment it was landed in front of my brother a plastic bag stuffed with papers and tattered clothes ". Ibrahim also said that his father brought a legist to the expulse the Jinn from the house, and after he (the legist) practiced his rituals in all corners of the house, he went out to the lobby of the house and cried, saying: "Jinn ,I challenge you to leave your place after the immunization which I did", but the Jinn did not wait the end of the legist speech and he throw a shoe on him . Ibrahim pointed his finger towards the clothesline which was near a room emerge of it a voice of intoned Koran, adding that "the Jinn has collected washed clothes from clothesline and set it on fire and burnt everything except prayer rug which stayed untouched with fire". All the time I spent with him in yesterday afternoon, Ibrahim did not stop pointing the indictment to a Jinn saying that he is behind all those accidents which the house became the scene of it in those days, Ibrahim does not accept ( based on his beliefs of faith ) even the mere suspicion that there is a human behind those fires and not a Jinn. I asked Ibrahim "But, what do you know that the doer of those fires is not one of your family members? ", then he answered with the same confident tone without any doubt that this phenomenon is out of any human, and he added while opening a wooden cupboard in his bedroom which its white doors have been charred because of the flames and said:" Look at that cupboard, it was closed, however the fire caught in the sheets which were inside it ,then how can a human to set fire inside a closed space of zero oxygen?!". 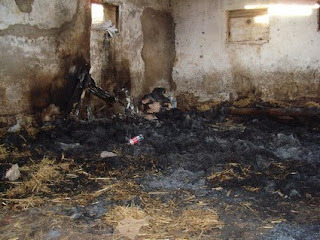 Ibrahim continued justifying his cause of belief that there were hidden beings behind those fires, saying that they (he and his family) tried to burn the remainder of those sheets out of the house but the fire did not ignite only after using fuel ignition materials. He further tried to remove the surprise of his interviewer and proceeded to tell some details of a similar accident experienced by a member of his family few months ago, as he said: "Over the last legislative elections (June 2009), my cousin (son of my aunt) and his family in "Dar Bouazza" district experienced a fierce war which its hero was a Goblin of the Jinn who did not leave anything or any place in the house without setting it on fire which caused heavy damage to the house to the extent that the walls began to crack due to the flames ". He also said that the trucks of the firefighters were not leaving the place until they have to return to it again, which was an expression of continuous fires without any reasons. He added that the landlord of that house has summoned the local authorities to investigate the origin of those fires which transformed his life and his family lives into an unbearable hell, but the investigations had failed to reach anything useful, except for some uncertainty doubts which attributed the burning to 2 servants in the same house , to make sure that those doubts were wrong that after releasing those 2 servants from the house , the fire accidents returned at the same pace. According to Ibrahim, his cousin who was then engaged in a campaign to achieve the collective presidency of the Council chair, has also knock on the doors of the legists and charlatans in requesting to rescue him from the "curse of the fire" that dogged his house and burned everything inside it. He said they (legists and charlatans) told him that (the causer) is a rival candidate who has embarked on doing "the witchcraft" to him by authorizing a Jinn on his house to abort the distract him and abort him of winning the elections, "but because of their with their fate, the things returned to its normality After two months of the war (the firing) and above that , he won in the elections" . One legist who practicing the legitimate spell tells that he faced a similar case where there were many accidents of stoning and firing , After he has done all the ways which he used to expelled the jinn from people's houses , the stones continued to be thrown on the house, as well as the flames continued to eat the house furniture, this has proved to him that such acts not because of the Jinn , but they are artificial. The first thing done by the legist (according what he said ) that to bring the landlord wife to read some verses of the Holy Koran on her, after he ordered her to paint her hands with something like the musk and after the end of the process and the departure of the wife , he heard a sound of a new stoning which meant that the process did not succeed, but the legist caught the stone and smelt it then he found that it has a musk-smelling , then he summoned the wife and posing the truth, so she acknowledged in front of her husband that she who was behind all disasters they have experienced such as fires and stones throwing , and the reason was that her refusal to stay in that house! In a similar incident in Saudi Arabia, a Saudi citizen living in "Medina" did not find a choice but to resort to some legists (Sheikhs), thinking that the Jinn was behind his disasters, after his house was burned 8 times continuously, then there was only one of those legists (Sheikhs) advised him to read some verses from the Holy Koran in all corners of his apartment before moving to the next apartment, but the fire was repeated 3 more times in his new apartment which located in the same building and the civil defense was not able to access the cause of the fire, and after investigations carried out about the third firing in the new apartment , the case addressed to the police, while the legists (Sheikhs) whom he called them confirmed that deeds were acted by the Jinn and they advised him again that he has to either leave the building or keep reading the praises and reciting the verses of the Holy Koran continuously inside the apartment, and this was according to a report which previously published by "Okaz" newspaper. Some days later, the police managed to uncover the mysterious puzzle when they found a matchbox between the ashes of the latest fire broke out in the new apartment which raised their doubts that there was somebody from the family behind those fires and after the following investigations , they have been reached to an amazing fact that the offender was one of the landlord sons and a security source said that the access to the child (landlord son) who is 12 years old came after observing the house, where he has been seen buying a box of matches from the grocery store which located next door to the family house , then the police arrested him and during the interrogation with him, he admitted that he burned the 2 apartments for 11 times in protest at his father's miserliness on his family, and he said that his rich father never buy suitable clothes for them and never give them pocket money and he treat them with remarkable stinginess. The source added that investigations (especially after the investigators visiting the child's school where he was found to go with dirty clothes though his father is capable to bring him new and good clothes ) and the investigation team discovered that the furniture of the apartment and family status are not appropriate though the excellent financial position of the father, pointing out that the child log full confession and was referred to the social observation house . Iwill collect the stories from people to help this site. If you want to fix such problem. Please contact [email protected] I know a Raki (Quran Reciter) who can fix such like problems. It was Devil who betrayed Eve & Adam ,and made them to commit sin .It has it own army and power .They are spread all over the world .They use human mind to do wrong things in the world .